The Mysteriously unYielding Null-Onyx Rampart of Cascading Amperes is a Rift weapon and is part of the Riftwalker Set. In the furthest depths of the swirling Rift, in the heart of that howling storm, there is a pocket of deep calm. In the silence of that alien oasis, the air itself whispers unknowable mysteries that devour the mind. This trap contains the recording of an echo of a question, and mice are irresistibly drawn by the unyielding mystery. The Mysteriously unYielding Null-Onyx Rampart of Cascading Amperes can be purchased from the Furoma Rift Trapsmith if the hunter has obtained the Null Gauntlet. It costs 16,400,000 gold, 1 Rift Blossom Branch, 8 Null Onyx Stones and 20 Rift Circuitry. It cannot be refunded. 18 May 2016: Mysteriously unYielding Null-Onyx Rampart of Cascading Amperes was introduced with the release of Furoma Rift. 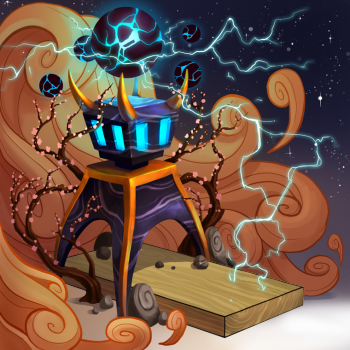 The trap's acroynm is M.Y.N.O.R.C.A, a reference to the Arcane Capturing Rod of Never Yielding Mystery, which has the reversed acronym of A.C.R.O.N.Y.M.